I began dancing when I was 5 years old in New Mexico. I still remember the box that held my ballet shoes, shiny and red. From there I took jazz class, then in high school I learn cheer routines on the junior varsity team in high school. It’s pretty standard that I’ll see a new move or teach a new move put it all together and it’s fine. Learning new choreography has always been easy for me. This morning was different. Dance class this morning had an awkwardness. Today I was in my head trying to see how what I was learning is going to fall into my hoop dance flow. I’ve gone to “hoop camp” as I like to call it, several times this summer. I went to Hoop Path with Jonathan Baxter, at Wakarusa I attended Luna Breeze’s workshops and most recently Spunshine. Hoop Path wasn’t too technical but I learned more about grace & just how to use my entire body. I felt like I went to boot camp all weekend – all 3 days. I rarely have to take pain relievers but I took some for it. The other two were more about tricks – you know the WOW EFFECT. So I’m trying to pull both the awareness of my body (& using both currents, hooping from the left AND the right) and slipping in tricks. Now where is where my dance classes come in – I want the attitude in there. When I dance hoopless there is a lot of attitude because I’ve been doing it before I can remember & I’m not trying to figure out where I need to put my hand, foot, leg, shoulder so I don’t drop my hoop & look wack. I usually don’t care if I look wack, rediculous, crazy, silly EVER but this past couple of years people will tell me “oh wow that looked so cool” when I hoop that I’ve become increasingly aware of omgpeoplearelookingatme. I’m just playing, it’s fun. I like how I look when I dance but today I was just trying to figure out where I was going to put my hoop doing certain moves, it was like a 2nd class IN MY HEAD. One of my favorite things about dance class is the mirrors. I didn’t have these mirrors in any of the hooping camps. So I don’t know WHAT I looked WHILE I was learning just what I recorded when I got home. 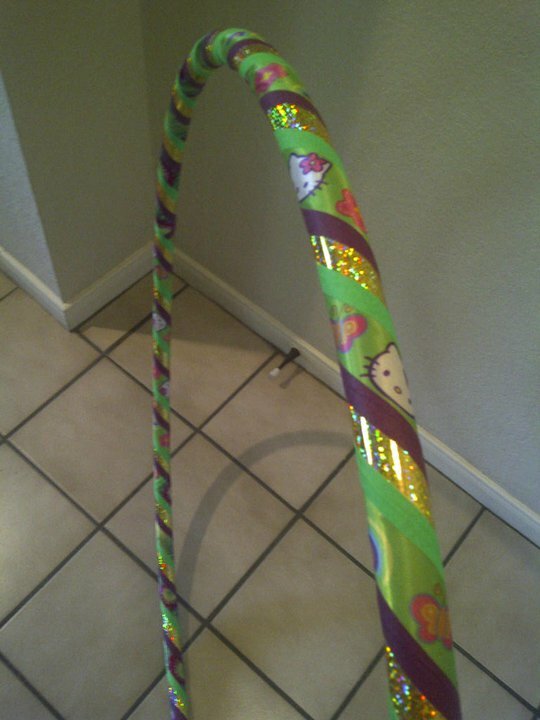 So basically I don’t remember sh!t from dance class today because I was thinking about what I was going to do with a hoop – if I had it in my hand or if I had two or if I was using poi. I had crappy flow & didn’t even enjoy myself much. I did however sweat a whole bunch & was totally out of step with everyone else which kept making me laugh. It made my flow weird. I’m not sure if I should combine what I’m doing in dance class with what I’ve learned in hoop camps so literally. Either way it was a fun thought to have a class that was more hoop attitude than either dance or tricks. I also know that next time I want to be more present for what I’m doing so I don’t walk away missing a whole hour of my life thinking about something else. This is one of my favorite hoops. It was designed by Rachelle at Rad Hoops.